This is a trap close to my apiary getting scouting interest. to list a very important SPOT for swarm traps. It is just one of those things that I took so much for granted that I didn’t even think to include it. I am sorry, I must be more thorough. One final spot to place traps is around your own apiaries. Currently I do ½- 1-1/2 miles from my hives. I am doing more experimenting this year so I hope to know more about it by July or August. I have heard stories from beekeepers of dead-outs that were occupied within their own apiary, but I have never witnessed it. I would like to give credit to the texasrepper2 on YouTube for bringing this to my attention. Thank you. 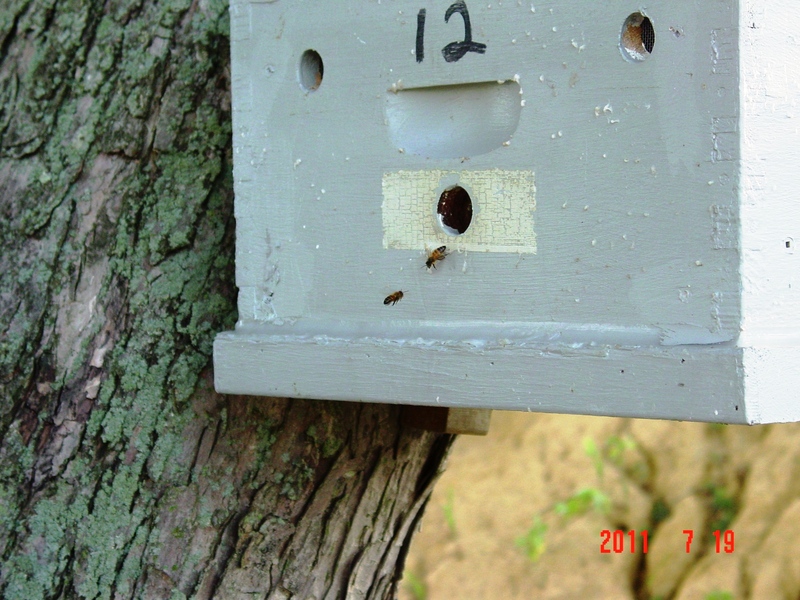 This entry was posted in Feral Bees, HowTo, Posts, Swarm Trapping and tagged bait hive, beekeeping, Indiana beekepeing, Jason Bruns, swarm trap, swarm trapping, treatment free beekeeping. Bookmark the permalink. We set up a trap in our apiary yesterday. Someone told use to use two brood combs and place it against the sides in the hive box so there is space in the middle. He told us to check it everyday during swarm season lest the girls start building comb off the lid. Please Let me know how it works doing it that way. I have been using 1 old piece of brood comb in the center. They have then built parallel to the first comb. It has worked so I havn’t change anything. Did you use foundationless frames in there? Let me know if they build true in the frames or cross-comb it. I still have at least a month before I need to worry about any swarm activity maybe 6 weeks. I just observed two hives today on the way home from work. I didn’t think they had a chance overwintering, but amazingly enough are still hanging on. I am waiting on dandellions before I stress my hives by getting inside them. First of all thanks for letting me know about the food pieces. Glad to hear you are no longer fearing salt too. I haven’t grown brussels sprouts yet, but I bet they are so sweet freshly picked. We used frames with foundation. So what are the girls using to build the combs on? Are there foundationless frames in the box in addition to the comb? That’s why the guy told us to check inside the trap every day–to be able to insert frames into the box instead of having the girls build the comb off the ventilation board. My weather has gotten cold and it’s raining today, so I am not able to figure out when the season is going to start. I just wanted to get the box out there before I forgot! Hope you are well and I’m liking the experimental nature of your bee explorations!! I am sorry, I didn’t explain. I use one piece of old comb and the rest are foundation less frames. Last year I used 4, but this year I will be placing 7 foundation less frames in there. I got tired of cutting comb loose from the top of the traps. When swaming bees are bloated on honey they have the ability to draw a lot of comb in a little time. I made it to check another hive site today. I felt they were all doomed last fall. I couldn’t believe it when I saw two of the three hives bringing in pollen! As long as I can get a good flow soon I will be riding high. Entered winter with 14 hives, only lost two so far….. Feral bees are my new best friend.